I am having some trouble understanding what loss function is being minimized to ensure that we are converging towards the best set of weights in the Genmatch function in R. I was reading the paper on it and if I understand right, it seems to say somewhat contradictory things on the same page. The loss function is indeed the minimum p-value resulting from a set of balance tests on the matched sample. The sample is formed by performing matching. The distance metric used for matching is the GMD. The GMD incorporates a vector of weights (one for each covariate). These weights are the variables over which the optimization occurs. 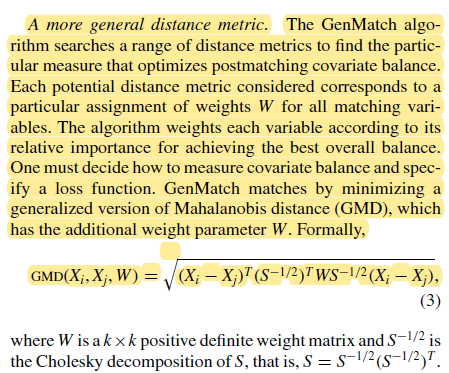 Working forwards, the algorithm estimates a set of weights, computes the GMD for each pair of individuals using those weights, matches pairs of units with small GMDs, then perform the balance tests in the matched sample. The smallest p-value from these balance tests is the value of the loss function for that set of weights. Then, a new set of weights is tried, and the smallest p-value is assessed again. The result of the algorithm is a set of "optimal" weights, which you can then use to compute the GMD in your sample, perform matching on the GMD, and then estimate the treatment effect in the matched sample. Not the answer you're looking for? Browse other questions tagged r matching observational-study or ask your own question. Can we use random forest for classification in combination with distance matrix between classes? ROC and multiROC analysis: how to calculate optimal cutpoint?